Here's an unusual bit of math: What do you get when you add "Jurassic Park," "Raiders of the Lost Ark," and "Ocean's 11," and then factor in a large slice of screwball comedy? Would you believe advanced biology? Such is the multiyear path that led Jonathan Losos, the Monique and Philip Lehner Professor for the Study of Latin America and curator in Herpetology at Harvard's Museum of Comparative Zoology (MCZ), to a study of virtually every known specimen of anole lizard fossilized in amber. Faced with a nonexistent fossil record and persistent questions about how a variety of lizard species evolved and then adapted to take advantage of the same niches across all four major Caribbean islands, Losos and colleagues, including Emma Sherratt, a onetime postdoctoral fellow in his lab and now a faculty member at University of New England in Australia, turned to amber—fossilized tree resin—in the hope of finding answers. Using micro-CT scanning to capture images of the skeletons of more than three dozen samples, Losos and colleagues found that different habitat specialists evolved to occupy the same niches they live in today, and have remained largely unchanged ever since. The study is described in a paper published this week in the Proceedings of the National Academy of Sciences. Sherratt is the first author of the study. Co-authors include Rosario Castañeda, a postdoctoral fellow in Losos' lab; Kevin de Queiroz, curator of herpetology at the Smithsonian; Luke Mahler, a former student in Losos' lab who is now a faculty member at the University of Toronto; and Thom Sanger, a postdoctoral fellow in Arkhat Abzhanov's lab in Harvard's Department of Organismic and Evolutionary Biology. Russell Garwood of the University of Manchester and Anthony Herrel of the Museum of Natural History in Paris also contributed to the research. "We found evidence for at least five different species, each corresponding to a different habitat specialist that exists today in the Dominican Republic," Losos said. "These data demonstrate that the structure of communities can remain little changed for extremely long periods of time." "I never thought something so beautiful, a piece of golden amber with a little lizard inside, could also be so important for our understanding of the evolution of these animals," Sherratt said. "The story of these fossils has been hidden away for millions of years; it is serendipitous, very exciting, and I'm glad I was able to tell their story." The findings are part of a start-and-stop saga that saw Losos negotiate with eccentric natural history collectors, track specimens through auctions both physical and online, and travel in style across international borders. 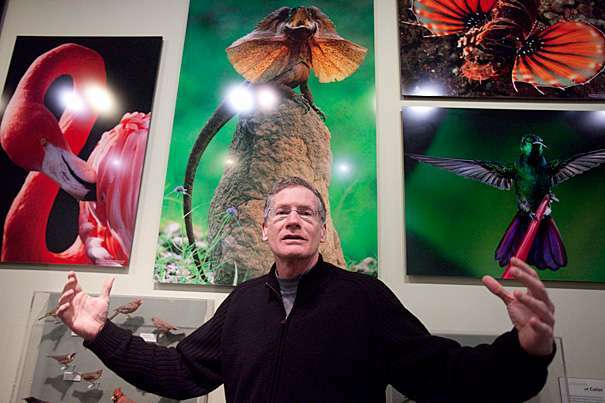 The spark that led to the study was struck nearly a decade ago, when Losos learned of a private collector in Oregon who was hoping to sell an anole specimen—only the fourth that was then known to scientists. "The sample he had looked different from the other specimens we knew about, so that got me interested," Losos said. "I thought, 'Maybe we can characterize what the fauna of these lizards was like 20 million years ago, so we could compare them to lizards today.'" Getting his hands on the sample, however, was easier said than done. The collector initially hoped to sell the specimen, which measured about 3 inches long by an inch wide, for as much as $1 million—a sum Losos obviously wasn't able to produce. Unable to find a buyer, the collector turned to Bonham and Butterfields, a San Francisco-based auction house. "I happened to be in San Francisco, so I went to see it," Losos said. "I went to this old warehouse in San Francisco, and they had all sorts of antique furniture and things, but in the back they had what they called their natural history collection. It had all sorts of items you'd expect to find in the MCZ—a rare stuffed flamingo, a mounted dinosaur that was 70 percent real bones, a fossil of a plesiosaurus in black shale, none pegged at more than $70,000 … and then they had this little piece of amber, that by then was selling for $100,000. I know what I would have bought with a spare hundred grand, and it wouldn't have been the lizard." No buyer emerged, and it seemed to Losos he'd never have the opportunity to study the specimen. But then, in 2009, he got another chance. The specimen sold in an online auction, and Losos was able to contact the buyer, a distinguished biochemistry professor at the University of Arizona. The two began drafting an agreement to ship the specimen to Cambridge for study. But after a period of email correspondence, the other end fell silent. Finally Losos received a voice mail with the news: "I listened to it, and it was his wife. It turned out he had passed away." The professor's widow, also a biologist, took it upon herself to hand-deliver the sample to Harvard. "Having finally gotten hold of this specimen, I was energized to see what else we could find," Losos said. "In particular, I was prodded by a colleague at the American Museum of Natural History in New York, who told me about a private collector in Italy who had an amazing collection of amber, including a number of these lizards. "I contacted him, and as far as I can tell, he may be the world's greatest collector of amber," Losos added. "It's an extraordinary collection—about 5,000 pieces—which he keeps in his home in Italy. He has all kinds of amazing things, spiders and beetles and moths and mushrooms … and, as it turned out, he has 20 of these lizards." Spurred by the discovery of such a large cache of specimens, Losos began digging in earnest, and was able to uncover several held by both private collectors and institutions, including a museum in Stuttgart, Germany, that had nine amber anole lizards. In all, he was able to identify a total of 38 specimens. In the case of the Italian group, the discovery was the easy part. The collector did not want the specimens to leave Europe, forcing Losos and colleagues to improvise. The solution they settled on was for Losos to carry the specimens from Italy to the Natural History Museum in London, where Sherratt and Garwood went to work scanning them. "The real treat was when I realized that not only could I see the skeletons, but in many specimens there was also preserved an outline of the animal in the amber," Sherratt said. "The soft tissue has rotted away, leaving an air-filled void that marked out the shape of the animal. "This was great, but even better was that the scaly skin had left its impression on amber, on the sides of these air-filled cavities. The detail preserved here was something we were not expecting. You can see the tiny body scales, and particularly, the expanded scales on the undersides of the hand and feet. These scales on the digits, called lamellae, allow the lizard to cling to surfaces like a gecko. The lamellae have been shown in modern species to relate strongly to the environment the animals live in. So by seeing these scales in so much detail in these fossils, we were able to make judgments on how the fossils might have lived." Before collecting the samples for transport, Losos had to determine whether he'd have to buy insurance to cover the cost of any specimens that might be lost or damaged. It turned out Harvard carries an omnibus policy that covers works of art ― which is how amber samples are classified ― up to several hundred million dollars. There was, however, one hitch. As part of the policy, Losos would have to fly first class. "It's a dirty job, but somebody has to do it," he joked. "I was actually quite nervous being the courier, because they are worth quite a bit of money. I was picturing having a briefcase handcuffed to my arm, but when the time came, the collector basically took out a box like a sweater comes in from the department store and just put the specimens in the box, handed it to me, and I stuck it in my backpack." To be sure, Losos said, the road to completing the study was long and winding—but thrilling, too, as a sustained encounter with the unknown. "In some specimens you can actually see impressions of the scales of its skin—it's a beautiful imprint of the exterior of the animal," he said. "But we didn't know what was inside. Sometimes the entire skeleton was there, and in some cases there was nothing left, it was basically a cast of the animal but everything else had rotted away." He added, "Every [specimen] was like a Christmas present. We never knew what we would find inside the ones covered in skin. Even the specimens that were just skeletons held surprises, like the ant we discovered in the head of one lizard. Of all the projects I've been involved with in my career, this has been one of the most fun. It's been a great adventure."